No and Me is that book that you wish you had a time machine for; the one you want to go back in time and thrust to your young teenage self, begging them to read it because perhaps, if they do, they'll understand life a little better and won't make all the mistakes they will. It's the type of novel that whisks you away into a completely different world, but its prose isn't flowery like that of Laini Taylor; instead, it's a more subtle type of beauty where each and every phrase simply makes you put down the book and think. I knew, even before I picked up No and Me that it would be amazing - it did, after all, come recommended to me by three of my most trusted bloggers - but I didn't quite expect the level of wonder, of emotion, and of nostalgia that this book would make me experience, all over again and somehow new at the same time. 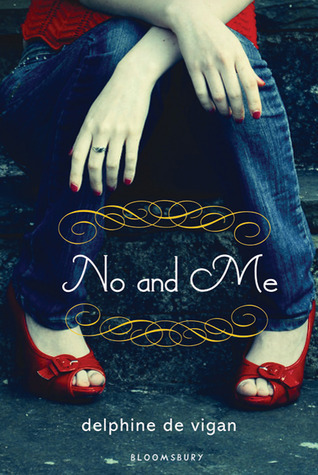 Truly, No and Me is a literary gem like no other and really, I cannot recommend it enough. Delphine de Vigan's debut into YA Literature seems to be a simplistic story, one of Lou, a thirteen-year-old precocious girl living in France who interviews No, a homeless eighteen-year-old woman, for a school project. Only, Lou can't stop thinking about No or the homeless life she leads and when she invites No to live with her, to become part of her family, she doesn't count on No's own past coming back to haunt, not only No, but Lou as well. In my eyes, the depth and beauty of this novel isn't in its plot or subject matter, but in its writing. Lou, as a highly intelligent teenager, sees life in a different light and it is this - her flashes of brilliance, her incredible insight - that made this novel so special for me. No and Me isn't an easy novel to read. I'm sure that we've all had an experience or two with homeless people, perhaps less if you haven't traveled outside of America. Ever since I was a child, however, I've been painstakingly aware of the plight of the homeless and beggars. Born in India, I witnessed hoards of homeless people daily, on every street, begging for money or selling cheap plastic toys to tourists in an effort to make a few cents. If it wasn't on the streets, it was in the railway stations as children sold tea instead of attending school, in the airports where they would greet you stepping off the plane - everywhere. I've visited India every summer since I moved to America when I was a baby, but it never fails to shock me, every time, the number of homeless who are still there, who will probably always be there, and most of all, the plight of those like us who are, frankly, unable to do anything. It is this lesson that Lou learns in this novel, this earth-shattering wake-up-call, but more than even her friendship with No, her dependency on her, her refusal to believe that No and herself really did not belong in the same world, let alone the same life and the same home, was Lou's life at home. Although this novel focuses primarily on No and her impact on Lou's life, it also focuses on Lou's parents; her mother who has been numb with grief ever since her second child died in her arms, her father who cares for No with an optimism that hides his inner grief, and Lou's own social awkwardness when making friends and approaching seventeen-year-old Lucas who is everything she sees herself as not being. For me, it was the realistic portrayal of Lou's home life, of her struggles with her parents and her inner insecurities about growing up with a mother who never really cared that touched me more than anything else. Perhaps best of all, though, is how painstakingly life-like this novel is. Its ending never wraps up any loose threads, never tries to explain No and her behavior or even the lives of those living on the streets, never tries to sugar-coat the fact that Lou's mother will never be the same despite the tragic events that happened years ago...it's almost an abrupt ending, one that leaves you smiling, with the twinkle dimmed from your eyes. Yet, it's a beautiful story, one that is written unflinchingly, told realistically, and leaves you wanting to simply hold the novel to your chest as you're forced to - yet again - contemplate the simple truths of existence that one person is too small to change. Nevertheless, this manages to be a novel of immense hope and although I wished for a slightly longer, dragged out, or even more conclusive end, I wouldn't have it any other way - this book is perfect, just the way it is. I'd urge you all to check out the reviews of Catie from The Readventurer, Maja from The Nocturnal Library, and Leanne from The Reclusive Reader. Great Review as always. This book sounds so good and to think that I hadn't heard about it till today. I first heard about this book when I read Maja's review and I'm so glad you loved this too, Keertana! This sounds so poignant and thought-provoking - just my type of read. I've never picked up a book about homeless people but I am intrigued to find out more about No's story and how she impacts Lou so much. My parents are from Hong Kong and when we visit, we always see homeless people there and there are countless TV documentaries about it. It hurts to see so many people on the streets through no fault of their own, especially in a city which is supposed to be flourishing. Books about unlikely friendships and more deeper issues always pull on my heartstrings and No and Me sounds too good to pass up. This one went straight on my TBR list after reading the first paragraph of your review, Keertana! I love how it's simply realistic. While I was born in America, my parents were not, so I have been abroad several time to poorer countries and it breaks my heart every time I see a homeless person. Even at school, I can tell when some people are struggling, and that breaks my heart as well. The fact that the author doesn't sugar coat anything makes me even more intrigued and makes me want to pick this one up. This definitely sounds like an emotional and thought-provoking read. Thank you for the amazing, in-depth reviews. I think your reviews always manage to touch on the real heart of a novel and capture why you should read it so much. I'll be adding this to my wishlist with hesitancy though because sometimes I hate these books because of how much they make you think and how they are to read. I like the sound of the fact that her parents are there and the novel focuses on them because lots of YA books have absent parents in their stories which is rather annoying. "this book is perfect, just the way it is." Lovely review Keertana! Lou, she sounds like an amazing character, since she's able to see so much and care about others. I'm glad this book shares the world deeply, the life of the homeless. I enjoyed the paragraph on what you witnessed in India. Beautiful review, Keer! I am sure everyone will be able to relate to this, at least I hope so, and your stories of India reminded me of when I visited Vietnam and every day we'd see so many homeless adults, but the kids really broke my heart. I know I have to read this, and soon! Oh, goodness. This book sounds absolutely gorgeous. I completely understand what you mean about reading one sentence and just sitting there and thinking about it. That happened very often while reading Saving Francesca. Lou and No sound like amazing, though contrasting, characters. I hope I get to meet them soon and enjoy their story as much as you did, Keertana! Your review reminded me how great this book is! I first read No & Me a few years back -- fantastic story, and I haven't been able to find anything else like it among other YA books. It's a touching story, but more than anything I love how the author keeps things realistic (which I think helps add an emotional layer). I stumbled across it in the library and I can't believe I never thought to buy it. I'll be ordering this next! It's one of those precious books where the story and character just stick with you long after you've finished. I know! This book just moves something deep within you and makes you see things differently, or rather, see them for what they are, at least for a while. I've never felt more lucky than when I finished it. It's just such an eye-opening experience. But what I loved most of all was that it was subtle. And you're so right about it being life-like, it's like a series of photographs, you see what you see, but no explanations are provided. I'm so happy you loved this one! And btw, I'm also happy you're reading Teeth, it's such a weird little book, can't wait to compare notes. Sounds like a very deep and thought inspiring book. Not sure if it would be for me, I tend to read to escape reality. Great insightful review though. I remember seeing Leanne's review for this so thank you for reminding about it, Keertana. I love that this one doesn't try to sugar coat things but makes you think about topics like homelessness through its realism. I'm going to try and get hold of a copy of this soon! What a gorgeous review. Your enthusiasm is infectious. I was curious about this book before but you've converted me completely. I'll keep an eye out for this one and grab if it the chance arises. Wow! That was a beautiful review, when I read it I was like in awe of the book and of how it is so realistic to daily life. I completely agree with you, it sounds like one of those books that can be quite heavy yet it shows such true and soul searching emotions. Such a brilliant review, Keertana. This compelling novel, translated from French, provides an eye-opening description of the causes and pervasiveness of homelessness as well as the effectiveness of the steps that cities such as Paris have taken to address the problem. Thoroughly entwined is a beautifully written story that shines an entirely different light on the bonds of family and friendship.